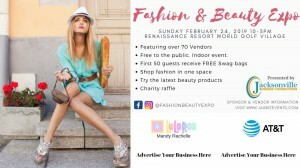 A day of beauty, wellness, fashion and fun is coming to the Renaissance Resort World Golf Village on Sunday, February 24! The Fashion & Beauty Expo, hosted by Jacksonville Business Connections, will be open from 10 a.m. to 3 p.m. and feature more than 50 vendors. If you’re always looking out for great wellness products and services, you are in for a treat! The September Health & Wellness Expo takes place at the Renaissance Resort World Golf Village on Sunday, September 30 from 10 a.m. to 3 p.m. The free event will feature more than 80 vendors offering products and services, many of which you can try on-site. Health and wellness workshops will take place throughout the day as well. More than 50 prizes will also be raffled during the event to benefit Project Balance (tickets are $1). Project Balance is a non-profit organization that guides at-risk children on the journey to emotional balance through yoga, mindfulness and self-esteem building outreach programs. Make sure to get there early! The first 50 guests will go home with a FREE swag bag. The September Health & Wellness Expo is sponsored by Jacksonville Business Connections. For more information, click here.